Order burritos, Chimichangas and salads from a Beach Burrito Co. near you. *Available in selected areas for a limited time. Conditions apply. Get Beach Burrito Co. delivered to your door! If you are searching for a filling and delicious burrito, look no further than Beach Burrito! Since it's established in 2006, Beach Burrito Co. has been serving Aussies exceptional Mexican dishes at affordable prices. Beach Burrito ticks all the boxes with the company being built on the pillars of quality, community and culture. There are thirteen restaurants around the nation and with each restaurant being uniquely designed to suit the local environment, there is no wonder why it is a hot spot for Mexican loving tourists and locals. From Taquitos and Burritos to Chimichangas and fresh salads, there is a delicious dish for everyone. 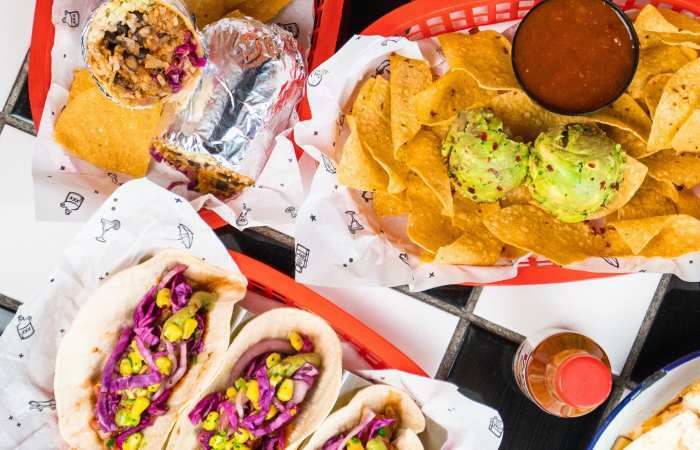 Beach Burrito prides itself on delivering a memorable experience as it mixes the beloved Aussie beach side culture with the healthy and tasty Californian style Mexican cuisine. If you are craving the colourful flavours of Mexico but life is just too crazy and you don't have the time to spend hours in the kitchen, Menulog has got you covered! Simply order in all the flavoursome dishes you want through Menulog. Whether you are in need for a quick weeknight dinner or entertaining some friends on the weekend, Beach Burrito is perfect for any occasion. Create your own Mexican fiesta from the comfort of your home. Log onto the Menulog app or website and within a few taps your mouthwatering burrito could be delivered right to your doorstep!